In 2011, I returned to Peru after a decade of exile. My first desire was to see the Pacific Ocean from the Costa Verde [Green Coast] cliff, an impressive geological monument, natural ecosystem and public space that bordered various districts in the city of Lima. To my surprise, I discovered that in the Barranco district (whose name alludes to the precipice) a section was severed by razor wire. At first glance it resembled a parapet, with characteristic vine plants with lilac flowers that had died around it. An exclusive building “with ocean view” would be built there, part of the “construction boom”, and consequently the loss of public spaces, that is currently occurring in Lima. 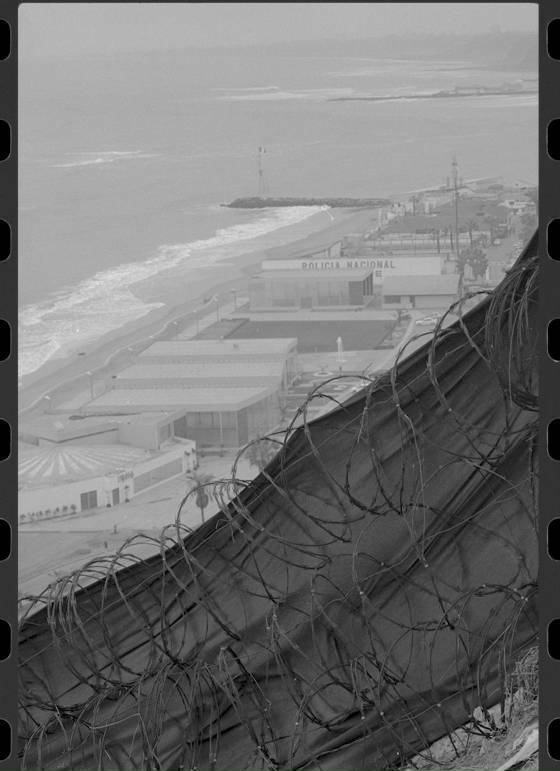 The razor wire, different from barbed wire, was designed exclusively for human populations: to distance or contain them on borders (Mexico-USA), concentration camps and prisons (Palestine), wars and check points (Iraq). Its growing presence in the Latin American landscape is recent. It’s employed for its deterrent effect, not only for the protection of property, but also to create social exclusion zones. Such is the case of various “marginal neighborhoods” in Lima that have been isolated from adjacent “exclusive neighborhoods”. “Razor Wire” is a series of photographs, sculptures and an architectural intervention that relates the transformation of the razor wire into stainless steel corn using only a hammer, anvil, and pliers. Each corn seed is a razor. The registration of this action, which includes views of the referred area in Costa Verde at the time, alludes to a performance. The final pieces were photographed in a Pre-Columbian reliquary fashion as a reference to the gold Peruvian Pre-Columbian sculptures that are exact replicas of corn.